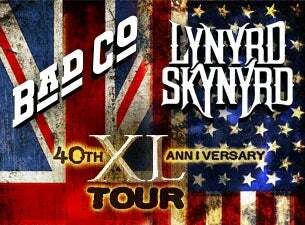 The Bad Company and Lynyrd Skynyrd co-headline tour made a stop in Charlotte, NC at the Verizon Wireless Amphitheatre on Saturday night to celebrate 40 years of music with “The XL Tour.” Both bands methodically cranked out all of their greatest hits during the show, 80 years worth of music. Lynyrd Skynyrd was up first to give the fans some down-home southern rock. They were led by guitarist Gary Rossington, the sole original member, and frontman Johnny Van Zant. Van Zant asked the crowd, “Are there any die hard Lynyrd Skynyrd fans here?” And the fans would erupt. He asked that question several times throughout the night to get the crowd in a frenzy. It was later revealed that Rossington and his backup singer wife, Dale, were celebrating their 31st wedding anniversary. Van Zant dedicated “Simple Man” to all of the men and women who have served in the armed forces. He later said, “Get off your asses,” for the fans to stand up to honor the American heroes. The spotlight shined down on a golden statue eagle sitting on top of the Confederate flag placed on the piano. The song started off slow and then the guitars were really blazing, especially Medlocke’s. The video screen featured a tribute to all of the fallen members of Lynyrd Skynyrd over the years. Tonight’s “Free Bird” was clocked in at eleven minutes forty-eight seconds worth of all-American freedom. During the intermission, the Live Nation video screen showed a slide that said, “Anyone who yells ‘Free Bird’ will be escorted out of the building.” Well, if that was true, the whole amphitheatre would have been empty. Bad Company was up next to close the night out. The Bad Co. show was being recorded by the DiscLive Network. This gave the fans the ability to purchase a high quality audio CD of the show they just attended. Bad Company consisted of the three surviving members: Paul Rogers (vocals), Mick Ralphs (guitar) and Simon Kirke (drums). Boz Burrell, original bassist, died from a heart attack in 2006. They were joined by longtime Heart member Howard Leese (guitar) and Todd Ronning (bass). Rogers got in position on the piano to begin “Run With The Pack.” He laid his microphone down flat on the top of the piano and began to sing in the mic while awkwardly bending over. Someone forgot to place the microphone holder on top of the piano. During the second verse, a crew member ran over and quickly placed the holder in front of Rogers. Rogers kept his composure and soldiered on through the performance. They left the stage and returned for the encore with the song “Bad Company.” Rogers started up the piano intro, with microphone holder in correction position this time. When the lyrics came to the “six-gun sound” part, smoke guns around the stage shot smoke streams. For the last encore, the acoustic guitars were brought out to Rogers and Ralphs for “Seagull.” The other original member, Kirke, later joined them on-stage to play the tambourine. Bad Company played all of their radio hits and then some. They still have ‘it’ after all of these years. Rogers still has a golden voice, hitting every single note. This was a very good co-headlining tour. There was no filler present all night long. Bad Company and Lynyrd Skynyrd brought their A-game which made this Saturday night so special.